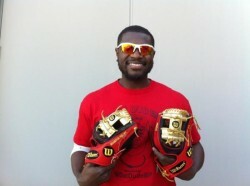 Brandon Phillips poses with the gloves at the heart of the lawsuit. I missed this somehow during the All Star break, but last Friday, Rawlings filed suit against Wilson in Federal Court. This is all because of the gold on the glove that Cincinnati Reds second baseman Brandon Phillips uses. Rawlings Sporting Goods created the Gold Glove Award in 1957 to give to excellent defensive baseball players. It is awarded each year to one player per position in the National and American Leagues. The trophy is a golden glove. Gold Glove winners also get a special Rawlings baseball glove “that includes metallic gold indicia on the glove itself,” according to the federal complaint. Phillips has a contract with Wilson to provide his gloves, and they have made a special one for him that has some gold trim on it. Obviously, this is an allusion to the Gold Glove Awards that Phillips has won. And that has angered Rawlings. It’s difficult to trademark or copyright a color, but Rawlings certainly has a case here. This lawsuit is only between the two glove makers, and Phillips is serving basically as evidence. We’ll see how this plays out, but it wouldn’t surprise me to see Phillips have to stop using those golden gloves. Posted in Brandon Phillips, Cincinnati Reds, Human League, NL Central. The Cincinnati Reds today officially announced what they’d been working on for most of the off-season: a contract extension for Brandon Phillips. Phillips, who was in the final year of his contract, renegotiated that into a new, 6-year contract worth $72.5 million. The new deal adds salaries of $10 million for next year, $11 million in 2014, $12 million in 2015, $13 million in 2016 and $14 million in 2017. Phillips is now signed with the team through 2017. Joey Votto is signed through 2023. Jay Bruce is signed through 2016. And Johnny Cueto, Aroldis Chapman, and Sean Marshall all have multi-year deals. The team has decided on a core group of players to build some winning teams around, but that’s not the most important thing. How does this compare to Yadier Molina’s off-season contract? The good news is that Phillips and Molina are both signed with their respective teams through 2017. Moline added 5 years to his current contract and will be getting $75 million during that time. His annual average is $15 million. During those same 5 years, Phillips annual average is $12 million. Clearly, Yadi has a more lucrative contract, but there’s no doubt that Phillips’ will take up a higher percentage of his team’s payroll than Yadi. I’m hoping we get more fireworks between the two. Posted in Brandon Phillips, Cincinnati Reds, Human League, NL Central, Wheeling and Dealing. In case you’d forgotten, Cincinnati Reds second baseman Brandon Phillips will be a free agent after the 2012 season. Phillips has campaigned throughout the off-season for an extension on his twitter account. Today, he spoke briefly to Cincinnati Enquirer beat reporter John Fay, and I mean briefly. It sounds like the Reds and Brandon Phillips’ agents met to discuss a contract extension Monday. I know Phillips isn’t a fan of the proceedings, but I’m happy with how the Reds have been handling the situation. Phillips has tweeted that the Reds won’t get a “homeboy discount.” Given the Reds’ low payroll, devoting elite bucks to Phillips for several years isn’t something the team can do. Phillips is likely past his best years. The Reds have to be smart about how they spend money, and giving Phillips the highest salary of his career when he’s past his likely physical prime is not smart. I love watching Phillips play, and I hope the team and him can work out something that doesn’t cripple the club. It seems unlikely at this point, so I’ll be sure to enjoy Phillips’ leather and infectious smile this season. 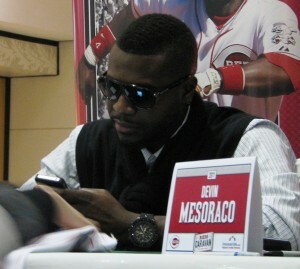 Posted in Brandon Phillips, Cincinnati Reds, Human League, NL Central, Spring Training. Posted in Brandon Phillips, Cincinnati Reds, Spring Training. 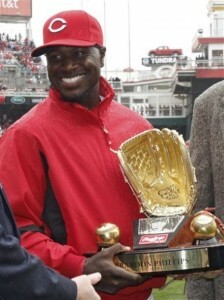 Brandon Phillips is among the winners of the LoveMyTeam.com 2012 Fan Friendly Seal of Approval. That’s pretty cool, and not at all diminished by the fact that they also gave one to rally squirrel hating Skip Schumaker. Posted in Brandon Phillips, Cincinnati Reds.